Joel Alexander Escobedo’s housemate hung roses off the light fixtures of their home. 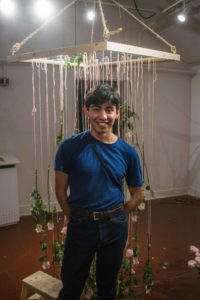 As the rose chandelier dried and became pale, Escobedo said this inspired him to create his own large-scale rose chandelier as an art installation to bring the student community together. Fifth-year art student Escobedo, who goes by and signs his artwork as Alex, invited people from the community to participate in the creation of “Bouquet.” The senior gallery show exhibited at the Eduardo Carrillo Gallery — a space designated for graduating art students to display their work — ran from March 9-15. “[The show’s] participatory. It invites anybody and everybody. It requires people’s engagement to happen,” Escobedo said. “Bouquet,” in its raw state, is a wooden grid hanging from a pulley system, a bucket of roses and a ball of yarn. “Bouquet” blossomed as people participated. Roses and yarn were provided alongside instructions on how to participate. Step 1: Measure out the length of your body with the flesh-tone yarn. Step 2: Pick a light-pink rose from the provided bouquet. Step 3: Tie one end of the yarn to the rose and the other end to one point on the wooden 100-point grid. hung their roses, they became part of the art piece. “After you measure out your body with the yarn and hang this rose that you pick from the bouquet, the rose then becomes a part of you,” said Escobedo. After a while, the art began to deteriorate, dropping leaves, petals and even some entire flowers. 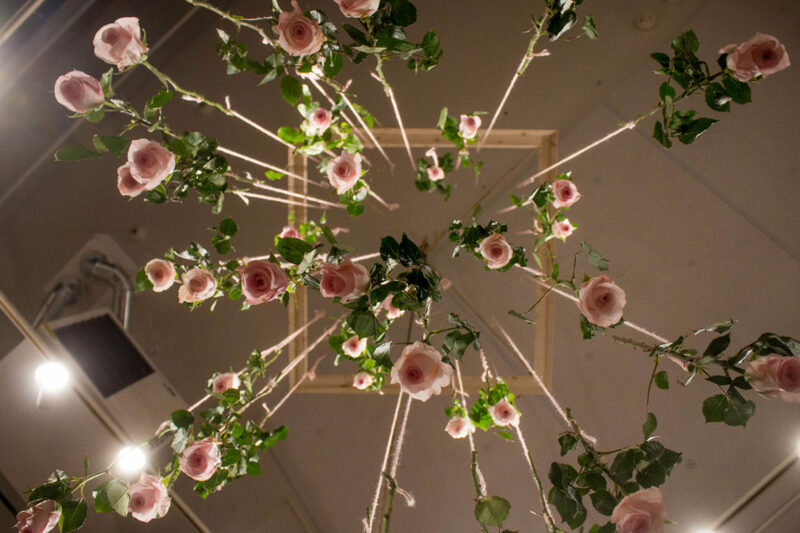 Within the first hour, about 35 roses were already part of “Bouquet.” The piece, in its final form, was expected to have 100 roses hanging at different lengths from the ceiling. The light illuminated the delicate pink tones of the developing “Bouquet.” The gentle sound of Trio Los Panchos — a Latin trío romántico musical group — echoed in the gallery as guests helped measure out each other’s height and one-by-one attached their rose to “Bouquet” in whatever style they chose. The artist expressed part of the reason why “Bouquet” was happening was to unite different communities into a space and to share the same experience in a particular moment. Fourth-year student Ezzie DeGiovanni expressed how compelling it was to participate in its creation. By the final morning, most of the roses occupied a space on the grid. The roses were limp and dried into a muted pink — almost white. Dehydrated leaves, once attached to roses, were scattered along the ground. Among the leaves, some roses had fallen off the apparatus and rested on the floor as the exhibit came to an end. 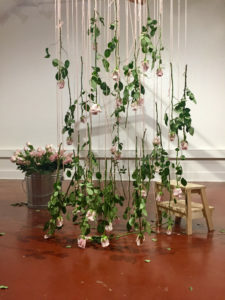 “After you measure out your body with the yarn and hang this rose that you pick from the bouquet, the rose then becomes a part of you,” Escobedo said.